Thank you for all the visits! The site rolled past 20,000 visits last night. I’m thrilled as fat caterpillar on a strawberry! Now here is a deal I got recently from a site called, http://www.steampowered.com/. I had never heard of Steam since they hadn’t left any sales fliers on either my house in Thorin’s Hall or the Angels house in Falathlorn, but apparently, Steam is a big gaming site. Who knew? Anywho… Short version… Steam’s offer was: 15$ = 1000 TP and a nice steed (and some stuff - Derudh’s Stone for 25% XP and some quest packs: ND, MM, Evendim). (Now 30$, see below. UPDATE 07/13 from Draculetta... back to 15$, "SUMMER SALE! Offer ends July 23rd" ) ...Get it while its steamy! You had me at steed. 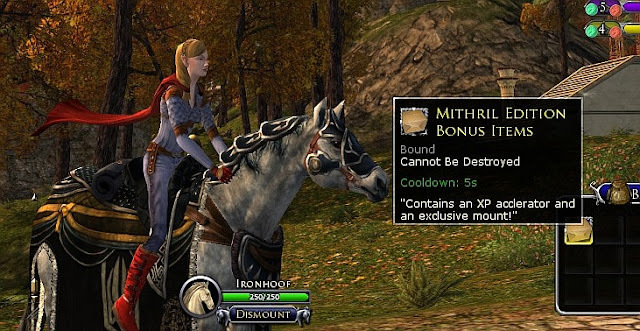 On purchase, a “Mithril edition bonus items” box shows up in your bag. (The horse sticking his nose in my bag in the picture is the Prized Isengard Steed (previously seen at Tonicbars-corral). Inside the box was the Noble Grey Steed and the Derudh’s stone. 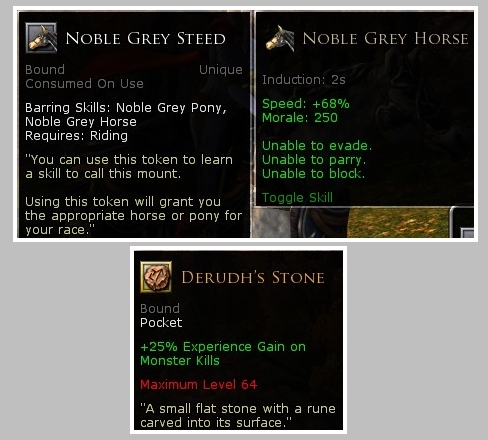 The Derudh’s stone is the identical one that came with the RoI expansion, and gives bonus XP til level 65. The 1000 Turbine Points apply automatically. The Noble Grey Steed is a much nicer looking horse than several that I have paid more for so I am pleased with the purchase. 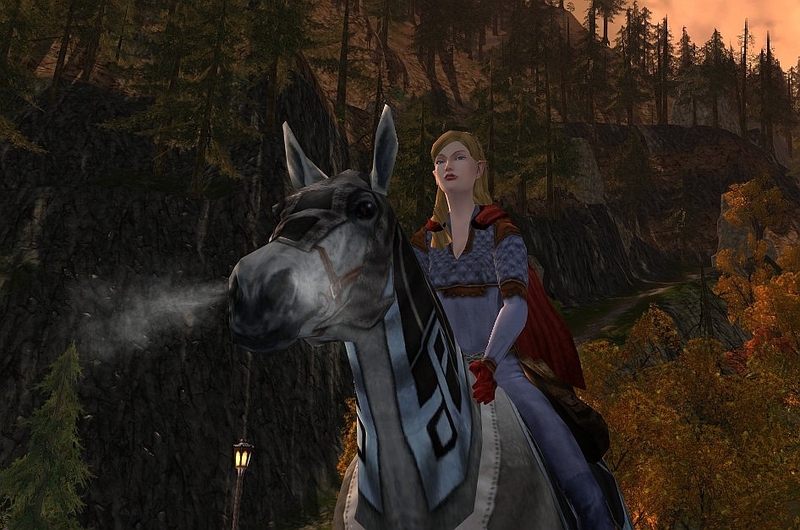 He has some in common with the Isengard steed, but clearly blowing steam out his nose is something unique. Would I have bought 1000 TP, a pretty horse, an XP token (I don't need), and quest packs (I don't need) for 30$? Mebbe, mebbe not. If it went on sale at 20$? Very likely. I will periodically check back to the site to see if the price drops again and will put out an immediate note on danania.net if I see a more reasonable price. If you need quest packs or just cant live without a horse blowing steam from his nose, the steam link is just above. Being a computer noob, I initially had trouble getting my key. My friend Jas pointed out that once the “steam program” is installed on my computer, I was supposed to right click on “lotro” in the steam purchase section to download the game of lotro, which would allow me to get the KEY just like Merric told me in his instructions (see cstm link above). For people with basic skills, I’m sure that was probably obvious. Thanks Draculetta! I'm updating the post to reflect the sale! Hi! All character will get the horse and the XP token? Yes. All characters on all servers will get the horse and the XP token. Each characters gets the box "Mithril Edition Bonus Items" as shown above. Best Wishes to you Anonymous!